"I saw in the night visions, and, behold, one like a Son of Man came with the clouds of heaven, and came to the Ancient of days and they brought him near before him. And there was given him dominion, and glory, and a kingdom, that all people, nations, and languages should serve him: his dominion is an everlasting dominion, which shall not pass away, and his kingdom that which shall not be destroyed." As supplies last, this book will be given freely without charge to individuals who would like to read it. This book was originally published through Roland Pletts Ministries in Harare, Zimbabwe Africa in 1996. I have read the book "The Shekinah Glory of Christ at His Coming" by Roland Pletts more times than I can count. Each new reading opens up more insight and brings a deeper understanding of the manner in which the Lord Jesus will return in glory to fully establish His kingdom on the earth. Since I have read and listened to so much other "stuff out there" on Bible prophecy surrounding the return of Jesus, it has taken several readings of this material with prayer and meditation to really grasp the simple truth of Christ's coming in our generation. The coming of our Lord Jesus to rule the earth as King has been a sought-after time for countless believers since the day Jesus first left His disciples in 33 A.D. Most sincere believers earnestly desire to see Jesus with His truth and mercy ruling the earth, but the manner and timing of His return have been debated and speculated for centuries. If there are 1,000 different doctrines being taught on any particular subject in the Bible, it will always be doctrine 1,001 when the Lord finally speaks on that subject. This is because His ways are not our ways, and until He speaks, we remain in the dark. 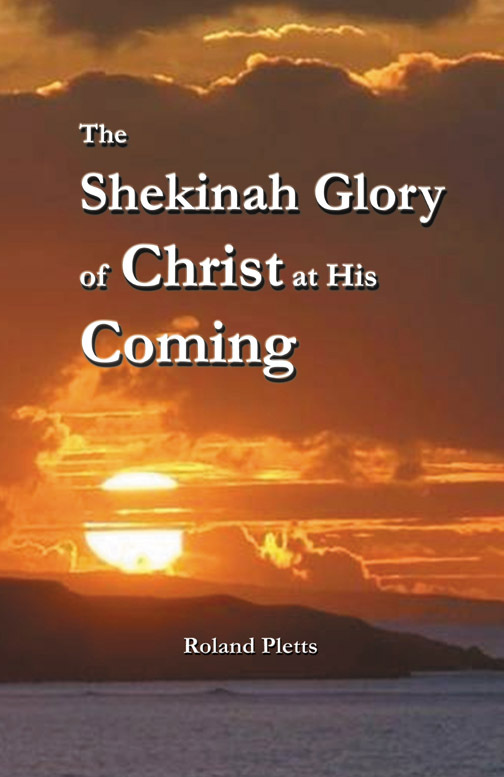 This book "The Shekinah Glory of Christ at His Coming" is a doctrine from the Lord on the manner of His coming. It is so simple that a child can understand it, believe it, and look forward to it. The reason this book has to be written is because there are so many other wrong belief systems regarding the way in which Jesus will return. The Bible is very clear that Jesus will return in the same manner in which He appeared to His disciples after His resurrection (Acts 1:11). But the doctrines of men have so cluttered the minds of God's people that when the truth is spoken it is often not received. When Jesus came the first time, He was not received by those who were looking for Him, because Jesus did not come in a manner they were expecting. Likewise, Jesus is coming again today in a powerful way TO His people and then IN His people to empower them with the same glory that He had when He rose from the dead. May this book help to free God's people to both hear and believe this "blessed hope" of how Jesus will return to visit His people in our day. My aim in presenting these notes is to impart a revelation of Scripture in as simple a manner as possible, so as to open you, the reader, to the exciting possibility that the coming of Jesus may happen in a manner you may not have considered. There is also the prospect of a time of great joy for His people as they prepare to meet Him and also for the great harvest at His return. Therefore, we need to understand HOW He will come, and what to expect when He does. May this quicken within you a great expectation for the Lord's return and a yearning for His Kingdom to come in power. These notes are in five parts. In the first section, I share the background of how I came to receive this revelation and God's confirmation of it. In the second section, I try to share the main truth about what the Lord showed me concerning His return. In this section I do not give any Scripture references, but in the third, and major section, I present Scriptural backing for the teaching, and step by step, give an overview of it. Then in the fourth section, I deal with related Scriptures in order to try and anticipate questions that may arise. The summary is the final section. I received Jesus Christ as Lord in 1964, and after a period of preparation, I went into Christian service. From early in my conversion I was interested in Biblical prophecy and the Lord's return. In 1974 I had an experience that dramatically influenced my spiritual understanding. Late one night I was praying out in a field when God allowed me to see something that was truly amazing. There suddenly appeared above me a group of huge luminous forms radiating a clear translucent light. They shone with an iridescent beauty that lit up the darkness like supernatural clouds. 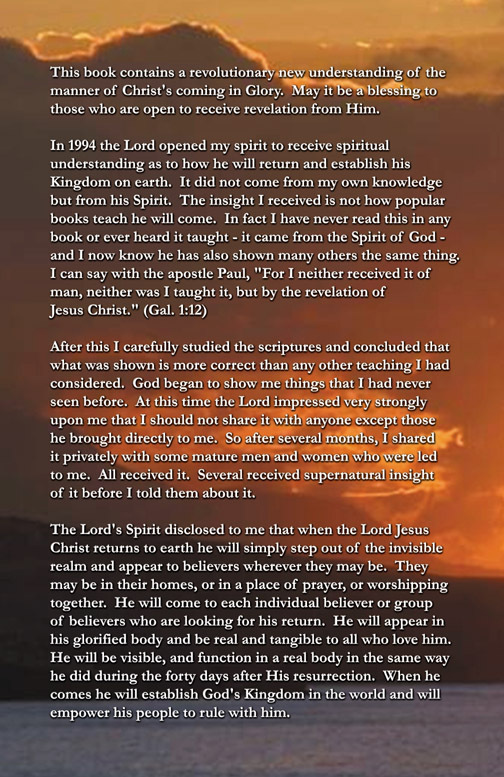 I knew immediately that I had seen something from the spirit realm which reflected the glory of God, and I began to earnestly search the Scriptures concerning the return of the Lord Jesus. As I did, He showed me things that I had not read in any books, and helped me to gain new insight into His word. For many years I continued to study Biblical prophecy, but still had difficulty understanding the actual manner of the Lord's return. It happened during a gathering in which the presence of the Holy Spirit was very evident with much blessing. I was sitting quietly praying, and asking the Lord what significance there was to the outpouring of His Spirit, when I was impressed by the thought that He wanted His people to be ready for His return. Then suddenly in a moment of time, and quite unexpectedly, the Lord opened my spirit and showed me something amazing about His return. The understanding of it came to me instantly and I was thinking about it when another quite unexpected thing took place. The leader of the meeting began to speak a "word of knowledge" from the Lord to me, in which he described in precise detail a recent event that had happened to me, about which he had no possibility of knowing. This event had been so unusual and life threatening that without question only God could have given him the information. In this word, the Lord said that He was now opening a new beginning for me. All this took place within moments, and was confirmation that it was the Holy Spirit who was speaking to me. We were in the Lord's presence with His Spirit in control and although the insight He gave me was a totally new concept for me, I knew in spirit the instant I received it, that it was the truth. After this, I carefully studied the Scriptures and concluded that what was shown is more correct than any other teaching that I had considered. God began to show me things that I had never seen before. At this time the Lord impressed very strongly upon me that I should not share it with anyone, except those He brought directly to me. So after several months, I shared it privately with some mature men and women who were led to me. All received it. Several had received supernatural insight of it, before I told them about it. Then, some time afterwards, something else happened. I was in a men's gathering and a man came to me, put his hand on my shoulder, and began to speak a word from the Lord in which the Lord said that He wanted me to be completely settled in the new revelation that He had given me; to have no confusion about it, and to be confident in sharing it with others. It just so happened that one of the men with whom I had previously shared it, heard the entire prophetic utterance, and was thereby witness to the Lord's words. In this way, the Lord once more confirmed it, and also released me to share it. Since then, there have been several more mighty exhortations from the Holy Spirit to share it. I have found that people who are uncluttered with dogma and moving in the Holy Spirit easily receive it. On several occasions, the Lord once again gave amazing confirmation of the teaching by revealing it directly to people, before I shared it, and I know of others who have received the same insight direct from the Lord. I asked the Lord how I should communicate what He had shown me, and I felt Him say that it should not be taught just in a theological manner, which would cause argument, but that He would impart it by His Spirit to those who could receive it. However, all teaching must be judged by Scripture, and flow with Biblical truth. The inerrancy of the Bible is our only foundation for truth. I have found as I have shared this insight that many people who are open to the Spirit of God, have received it and even when not immediately understood by some, it has been confirmed to them, as they have sought the Lord. I believe that this revelation came from the Lord, was immediately confirmed by a direct word from Him, is established in Scripture, has been imparted supernaturally to others, has been tested by mature believers, and that I was then directly released by the Lord to share it. In simple obedience, as best as I am able, I do so now. In Part 2, I will outline what the Lord showed me, but I do not intend to give Scriptures at this stage, as I will do so later. The Lord's Spirit disclosed to me that when the Lord Jesus Christ returns to earth, He will simply step out of the invisible realm, and appear to believers, wherever they may be. They may be in their homes, or in a place of prayer, or worshipping together. He will come to each individual believer, or group of believers, who are looking for His return. He will appear in His glorified body, and be real and tangible to all who love Him. He will be visible, and function in a real body, in the same way that He did during the forty days after His resurrection. When He comes, He will establish God's Kingdom in the world, and will empower His people to rule with Him. When Jesus comes, His people will be able to see Him, and He will be able to touch them. When He reveals Himself to believers, they will be changed, as He releases His power and glory into them. Then, as they walk in this new power, they will rise up and witness Christ to all nations with great liberty and mighty miracles. His Kingdom will grow and fill the whole earth. For forty days after His resurrection, Jesus lived on earth with His people. He taught them, instructed them, ate with them, and did many other marvelous things. He was real and could be seen and touched. Satan could not attack Him, neither could His enemies. His disciples met with Him, and He appeared wherever He wished, with no restrictions: in a garden, in private homes, by the seaside, on the road. He appeared to individuals, and groups, and then a crowd of 500 saw Him. Multitudes of deceased saints also rose and appeared to many people. But only believers saw Jesus, as there is no record of any unbelievers seeing Him. His resurrection presence transformed the disciples. This was a preview, or foretaste of what will happen at His return. When Jesus went away, He promised to come back to earth and establish His Kingdom. The angels said that He would come in "LIKE MANNER." As I will show, this referred not only to the way in which He departed, but also to the manner in which He had been with them for the forty days. The SAME Jesus will return in the SAME way (Acts 1:11 NIV Bible). We are told quite clearly that the state in which Jesus was taken into heaven, is the same state as that in which He will return to earth. In other words, the same Jesus who was crucified, and then rose again, and walked with them in resurrection, will appear, as He was while with them during the forty days. Just as Jesus came to believers at that time, so He will return to His people wherever they are. Believers will then see the Lord, for He will be visible, as, and when He desires. He will reveal Himself wherever He wishes, whether to individuals, small groups, or large congregations. Nowhere in the entire world will be out of His reach, although not everyone will be able to enter His presence. However, those who love Jesus will see Him. He will unexpectedly return and appear to all who are His. It could be at any time. If Jesus is your Lord, you too will see Him. One day, as you are going about your daily tasks, He will be there; Jesus will suddenly stand in your presence. When the King returns, He will come in the power of His Kingdom, which will grow and fill the whole world. By His "PRESENCE," He will change and empower His people, and through them rule the nations. His people will rise into a new liberty, free from carnality that works death, and the Kingdom of God will come with authority into all the earth. The presence of the King IN His people will assure victory. There will be no mistaking the risen Lord, when He manifests Himself - He will appear in risen glory to His people, and He will be real and tangible. His personal manifestation to His people will be at His visible return to be with them, in glory. His manifestation to the world will then be through His people, who will display His glory, having been changed by Him. The return of the risen Lord is the next step in God's unfolding plan to submit the entire world to Himself. The presence of Jesus will bind Satan, and leave him powerless to deceive the world. Over the last two thousand years, the Gospel has gone into all nations. Through faith in Jesus Christ, salvation has been made available to all the families of mankind, and there are now devout believers in every nation. They form the Body of Christ, His Bride and Temple. It may seem in places as being small and insignificant, but it is the bridgehead to which Jesus will return. In these end-times, the Lord is establishing a world-wide net that will cover all nations. The Gospel of the Kingdom will be preached for a witness to all nations, and then He will return. At His coming, His people will be represented throughout the world. Believers are citizens of His Kingdom, and it is to them that Jesus Christ will come. When Jesus returns, He will be with His people, not just in His Spirit, but in a Real, Visible Presence. True believers are the base through which the Lord will work in the next great step in God's plan - to take the world for Jesus. He, Himself will return to direct it. Believers proclaim the Gospel, but only the King can establish the Kingdom. One day, His people will have dominion and rule; but not without the King. When the King comes, His Church will be transformed and empowered to rule the nations. The return of the King will break the power of evil, demolish the rulers of darkness, destroy the wicked, and blow the systems of the world wide open. Then, "IN HIS PRESENCE," there will be the greatest harvest ever seen. Millions will turn to Him, and the world will see the inauguration of the Kingdom of God on earth. The age of miracles, resurrection and power, will have fully come. This is what the prophets of old saw when they described the Glory of God filling the whole earth. This may be new to you, but it is in fact quite Biblical. In the following notes, I will show that the terms such as "coming on the clouds" and "caught up in the air" are metaphors; terms derived from Biblical figures. The Bible gives examples of what they really mean. They are to be interpreted spiritually, as they illustrate Biblical concepts which help us to understand deeper aspects of the return of Jesus. I will show that His promise to return to earth will be fulfilled in an amazing manner by Jesus simply stepping back into the visible realm, and empowering His people to take the world. When He comes, He will heal the rift between the natural and spiritual realms, and after a purging, will eventually unite and harmonize them into one perfect new creation. If we use this definition, the Scriptures reflect a new concept of what the “coming” of Jesus Christ really means. Instead of Jesus coming to rapture His people away from the world, it rather has the meaning of His coming to be present with, and alongside His people, in an extended period of time, during which His “PRESENCE” will be felt in a new and powerful way on the earth. Throughout these notes, when the word ‘parousia” is referred to, it will be considered as Christ’s “presence” and subsequent “being alongside” His people. The “Presence” is by no means a New Testament concept only, but is at the heart of the Old Testament revelation of God. It was “His Presence” dwelling with His people in the Tabernacle that was the central theme of the Old Testament covenant, and became the all sufficiency of God to His people. In the New Testament, this took a further development, when for the Christian, “His presence” becomes a living reality, experienced by the indwelling of Jesus through His Spirit. Every individual believer becomes a Tabernacle for God. However, when Jesus returns at His “Parousia,” His presence will be further expanded and take on new significance when He will be with His corporate body of people, in a new way. The “Parousia” then, is the return of the Lord Jesus Christ to be with His people. It is not just an invisible manifestation of Christ, when there is only His “presence,” or even an outpouring of His Spirit, but it is His “VISIBLE” appearance to His people. The apostle John made this clear when he wrote that believers should abide in Him so as not to be ashamed, when He “appears” at His “Parousia” (I John 2:28). This word “appear” is defined in Strong’s Concordance (phaneroo); "to render apparent, to manifestly declare and show oneself.” Vines Expository Dictionary says that the word means more than to appear; it is to be revealed in one’s true character. Yet another word used is “apokalupsis,” which means revealing, or unveiling. It assures us that a day is coming when the veil will be lifted from our eyes and we will see God’s glory in Jesus unveiled (II Thessalonians. 1:7-8, I Peter 1:13, 4:13). We will consider deeper aspects of these words later, for they describe the day when Jesus will be bodily present with His people, in visible manifestation of His splendor and glory. He will then usher in the “Day of His Reign,” and as King, will rule with His people and through them subdue the whole world to the Kingdom of God. Throughout the Bible, the emphasis is on the Kingdom of God on earth. Throughout the centuries, the focus has been on “going to heaven,” but that does not change the promise that Jesus will return to earth. If we examine the prophecies, and especially the shadows and types of both the Old and New Testaments, we will find that there is a great weight of support for this; and that it is far more Biblical than what is often taught. We need to see the whole pattern and strategy of God, as He reveals His plan through progressive events, which bring His Kingdom ever closer. We need to consider the manner in which previous events took place, so as to understand how future events will come to pass. What does it mean, “He is coming on clouds?” When Jesus spoke to the high priest, He confirmed that He would come in the clouds of heaven, in power and glory (Matthew 26:64). Jesus often taught in parables and figures of speech. He was the master of metaphor. Many things that He taught were not openly revealed, but had to be received and understood by the Spirit of God. When we consider His teaching about His return, we must not try to understand it in a natural way, but must interpret it from a Biblical perspective. He was not referring to the clouds of vapor that bring the weather, but to clouds of “power and glory.” In this way, Jesus gives us the clue. We therefore need to look at Biblical clouds of God’s power and glory in order to understand what He meant. Throughout the Old Testament, God revealed His power and glory in a cloud. The CLOUD represented the supernatural “presence” of God with His people; i.e. in crossing the Red Sea, in the wilderness, indwelling the Tabernacle, filling the temple, and so on. The cloud was the Visible Manifestation of God, dwelling with His people. The cloud was visible, but could not be approached by everyone. In fact, God warned the people not to come too close; but Moses approached and entered it. When he went into the cloud, he met with God, face to face. The cloud was the visible manifestation of the “presence” of God, and those who were able to enter the cloud saw God! The prophet Ezekiel saw God in the cloud and described His majesty and power. When Isaiah went into the temple, he saw the Lord, high and lifted up, and the glory of God filling the temple like smoke. This was the cloud of God’s glory. The cloud displayed the visible presence of God, the place where God functioned, where God’s Glory was revealed, and where God met with His people. Exodus 13:21,22, 14:19-24, 16:10, 19:9,16-21, 24:15-18, 33:9-11, 34:5, 40:34; Leviticus 9:23,24, 16:2; Numbers 9:15-22, 12:5-8,14:10, 16:19, 42; 20:6; Deuteronomy 31:15; 1 Kings 8:10-12; II Chronicles 5:13, 14, 7:2; Ezekiel 1:4-28, 10:3,4, 43:1-5; Isaiah 6:4. The Tabernacle, or Tent of Meeting, became closely identified with the Presence of God, for the cloud came to rest in the Holy of Holies and there, God dwelt with His people (Exodus 25:8,30, 33:9-14). As Solomon declared, “The Lord has said that He would dwell in the thick cloud.” (II Chronicles 6:1). The Shekinah, the nearest Jewish equivalent to the Holy Spirit, became, with other Old Testament ideas and derivatives, Word, Wisdom, etc., a bridge between man’s corporeality and God’s transcendence. It is used by the Targumist and Rabbi to signify God Himself. It underlies the notion of God dwelling among His people. The glory of God, “kabod” in Hebrew, and “doxa” in Greek, is another name for the Shekinah. In the Old Testament, therefore, the cloud represented the Visible Presence of God indwelling His people. It is the environment of God, the place in which He dwells and functions, and meets with His people. The cloud rested in the Holy of Holies, and was closely associated with the Ark of God. Once a year the high priest went into the sanctuary and met with God. The “cloud” was God’s special, Visible Presence and Glory, abiding with His people. Jesus said that He will return on the “clouds of glory.” He is using Biblical terms to convey something. Although the cloud may not be visible any longer, it is just as real in that the presence of God can, at times, still be felt and sensed. His presence is especially real in times of deep worship, when believers have entered within the spiritual “veil of His presence.” At His return, or Parousia, Jesus will again be with His people, just as the cloud was in visible glory. Those who enter within the veil of “the cloud of His presence” - the realm of the Holy of Holies, will see Him. When Jesus went up to the Mount of Transfiguration, He was transformed in glory. He gave the disciples teaching about His future coming in glory, and six days after this, He gave them a preview of that glory on the Mount of Transfiguration. He met with Moses and Elijah, and the bright cloud of God’s presence came upon them. This event was later described by Peter as the “Parousia” of Christ, and he also used the same word to describe the future return of Jesus. Although the two events are separated by thousands of years, there is a similarity in terms. Peter first described the “Parousia” at the Transfiguration (II Peter 1:16-19), and then described the “Parousia” at the return of Jesus (II Peter 3:4, 12). He looked back to the display of Jesus’ glory on the mount, and then looked forward to the promise of the new day of His future glory. In Peter’s mind, what he saw on the mount was like a preview, or illustration, of what will happen at the future Parousia, or presence of Jesus. He said he was not telling stories about Jesus’ glorious coming, because he was already an eyewitness of it. Notice that Jesus and the disciples did not leave the vicinity of earth to be in the realm of transfiguration and glory - in the cloud of God’s presence; it all took place with their feet firmly on earth. Jesus was present in glory, and both the deceased and living saints met together “in the cloud” of God’s Presence. When the apostle Paul saw the Lord on the Damascus road, he described it in similar terms as the transfiguration. At the birth of Jesus, God’s glory was also revealed. All these displays of glory were not far up in the atmosphere, but in the immediate vicinity of earth (Acts 22:6, 14, I Corinthians 9:1, 15:8, Luke 2:9). The Glory of God is described in I Timothy 6:14-16. No one can, on their own initiative, initiate or through their own ability, see this glory, but Jesus who shares glory with the Father will Himself appear in it, and reveal it to those who are His. He will come back “in the clouds of glory.” The cloud of God’s glory was never somewhere up in the atmosphere, but was always His visible manifestation on earth, in the immediate vicinity of His people. What did Paul mean “caught up in the clouds to meet the Lord in the air?” Just as the Lord spoke in figurative terms, so Paul also used metaphorical Biblical terms to describe the mystery of what will happen at the return of Jesus. Like Moses, they will be able to enter the cloud and see Him, face to face. This will take place at “His Parousia, or presence.” The term “in the clouds” does not refer to natural clouds in the atmosphere but, as we have seen, is a spiritual term to describe Jesus’ power and glory, when His presence is with His people. Note the order: first the dead come back with Jesus and have glorified bodies, then after that the living will be changed and will join them in “the clouds of glory,” which is the glorious presence of Christ, as He indwells His people. Note that this is not necessarily a simultaneous event, but is a sequence. It is the individual believer’s change that happens in a moment, in the twinkling of an eye, as and when Jesus reveals Himself to each one at His return. The term “caught up” depicts a forceful event. The Greek word is “Harpazo” and conveys the idea of force suddenly exercised (Vines) and is used to describe a powerful release of God’s energy. Paul was caught up to the third heaven and did not know whether in or out of his body; but he had access to the spiritual realm and heard words which could not be expressed in human language. Paul did not necessarily physically leave this world. Philip was also mightily moved on by the Spirit of the Lord, and was caught away from one place to another, but did not leave the earth. It seems Ezekiel also had a similar experience. Each received a powerful intervention of God’s power, which released them from the normal restrictions of this dimension, although they remained in it (II Corinthians 12:2-4, Acts 8:39, Ezekiel 8:3, 11:24). The use of the same word by the Lord reveals its meaning to us. He said that the Kingdom of God suffers “Harpazo” by men of force (Matthew 11:12). This is a difficult Scripture, but the NIV says, “the Kingdom of heaven has been forcefully advancing, and forceful men lay hold of it.” Men enter into it by the Harpazo power of God. It conveys the idea of pressing into and possessing the Kingdom (Luke 16:16). Each time that Jesus did a miracle, He reached into a future age, the Kingdom Age, took hold of it and released its power into the present situation. Through “Harpazo,” believers were able to take hold of, and enter into the Kingdom. They were not taken out of the world, but rather experienced the power of God coming into them to change their lives and situation. The Harpazo is the forceful dynamics of God to catch up something into His power. Paul used it to describe a future release of God’s power into believers, to clothe them in the life of Christ. The “Harpazo” is the dynamic power of God to catch believers out of their fallen condition of corruption, and transform them into the risen life of Jesus. It does not mean a catching out of the world, but out of a state - that of carnality and weakness, into that of spiritual power. In His resurrection, Jesus exhibited a new dimension of being, an order beyond the physical. The Harpazo is to be released from the restrictions of this present mortality, and to be caught into the freedom of Jesus’ life at the time of His return. If the clouds at the return of Jesus are not weather clouds, but the spiritual clouds of God’s presence and glory, then obviously the term “in the air” must also convey a spiritual phenomenon. Paul did not mean that believers will go up into the clouds in the atmosphere, but that believers will enter into the presence or realm of Christ’s power and glory. The word “air” is used in the New Testament for both natural air and the realm of spiritual powers. In the book of Revelation it is used in the context of angelic activity, and in Ephesians 2:2 it describes the realm and work of “the prince of the power of the air.” This power is over a spiritual dimension, rather than the natural air and its weather patterns. Paul linked the realm of the air with the “heavenly places,” or heavenly realms and described how spiritual battle takes place in this realm. The realm of the air is also the realm over which Jesus has ultimate rule. Jesus has been raised to heavenly places, and the Church is seated with Him, there. This dimension will be opened for believers . (Ephesians 1:20, 2:6, 3:10, 6:12). The word “air” is used together with the word “wind,” which also denotes both natural and spiritual realities (Ephesians 2:2). In the New Testament the word “wind” almost always conveys the meaning of “spirit” and, in the same way, when the apostle Paul spoke of “air” he was certainly not referring to what we breathe, made of nitrogen and oxygen, but was referring to an invisible spiritual dimension. “Air” is the nearest Paul could get to describe this invisible realm. Just as air is real but invisible, so Paul used it to describe the very real, but invisible realm which is very close to us. It is the spirit dimension which is not far off, just invisible, right here “in the air.” Paul did not mean that believers were to be caught up into the atmosphere, but that believers would have access to the Spirit dimension. Believers will be caught out of their present condition, which is subject to mortality, and into a spiritual condition, subject to immortality. The “air” is the Spirit realm that Christ rules over, and which will be opened for believers. At His “Parousia,” believers are not going up into the weather clouds, but are going into the “presence” of Jesus, at His return. The invisible kingdom of the air (NIV), is in the air all around us, and believers will have access to it. Immortality will be released into God's people. Immortality is not being subject to death; it is deathlessness. However, it is not unending existence outside of God. Such a prospect is frightening! According to Vines Expository Dictionary immortality (Athanasia) is more than deathlessness. It suggests the quality of life enjoyed by the believer when mortality is “swallowed up by life.” The immortality that Jesus offers is to be found in Him, the source of life and joy. It is a release from the carnal principle that works in us, producing death, and is a joining in union with the Lord (II Corinthians 5:4; Psalm 16:11). The Lord has immortality (I Timothy 6:15,16). He was free of sin, and no curse of death operated in His life. In Him was the life of the Father. Jesus is the author of life and light, and its very source (John 1:4, 5:26, Acts 3:15, Colossians 1:16). Even in His earthly life, He was not subject to the restrictions of His body. He was able to walk on water, and could pass right through hostile crowds, either by being invincible or invisible (Luke 4:30, John 7:30, 8:59, 10:39). It is believed by many that Jesus did not have to die, but that on the Mount of Transfiguration, He could have changed His body into a glorified condition. No one took His life from Him, but He voluntarily submitted to death (John 10:15-18). When Jesus died, it was not possible for death to hold Him (Acts 2:24). After His resurrection, He displayed His immortality to His people, and at His return He will release it into those who are His, who will then be able to live and function in a way that is no longer subject to the physical dimension. They will function in bodies that are imperishable, powerful, glorious and spiritual, made like the man from heaven. It will be a worldwide replication of Christ in His people (I Corinthians 15:35-48). This release of power will fill His people and will endure and increase during His reign. During this time, immortal believers will be able to function on earth. At His coming “parousia,” or “presence,” they will experience a change which will release them from the restrictions of their present mortality, and give them access to Christ and His power. Believers who have already died will rise in resurrection and reign with Jesus and be able to function like angels (Luke 20:35, 36). Believers who are alive will be changed so as to enter and share in the life of Christ and will continue their lives in newly empowered and changed bodies, not subject to time or decay or the restrictions of this present dimension. They will be like Jesus was while on earth, not subject to death, and like Enoch, will one day be able to walk through the veil into God’s presence without dying. Through Harpazo, they will be able to possess the Kingdom of God. There are three groups of people on earth when Jesus returns. There are the wicked God haters and Christ rejecters, who will be destroyed. There are the true believers in Christ, who will be changed to become like Jesus, and then rule with Him over the world. And there are the remainder, who will come under the authority of the Kingdom of God. The Day of the Lord is the time of Christ’s reign on earth. It commences at His Parousia, and continues until death is abolished, wickedness defeated, and the “New Jerusalem” appears coming down to the earth. The emphasis throughout the Bible is that the Kingdom of God will come to earth and subdue the whole world. How will this happen if He does not have a people? Who has ever heard of a Kingdom without a structure, without administers and rulers, and people who function in it? God will empower His people and He will rule and reign through them. In His church, the Lord has established a worldwide net, which will take control of the nations and gather in a vast catch. All authority is Christ’s, and He will have complete dominion over all nations. It is the righteous rule of God through the one and only Sovereign, the King of kings and Lord of lords (I Timothy 6:15). When will this happen? At His PRESENCE, or Parousia. The apostle Paul wrote that the whole creation groans as it waits for the unveiling or “manifestation of the sons of God.” There is coming a public manifestation of God’s Sons to the whole world. Paul taught that believers can be victorious over the sinful nature through the Spirit of God, and that one day their mortal bodies will be quickened by God’s Spirit to receive redemption. He described it as the “glorious freedom” of the “sons of God,” for which the whole of creation waits. Believers will be set free from the corruption of the mortal body with its carnality, sickness, pain, weakness and death. In that day nothing will be able to harm the believer. It will be a public display of God’s glory in the believers. At that time, the glory of the “Sons of God” will be evident to all, for it will be unveiled. The statements that Paul makes in Romans chapter eight, cannot be fully appreciated unless they are placed in the context of chapter seven in which he describes the conflict within the believer between the carnal or sinful nature, and the desire to serve God. The sinful nature fights against the Spirit (Galatians 5:17). Paul says that he is “carnal sold under sin,” and describes the law of sin and death, which he is powerless to overcome. This war is within the members of his body, and works in him to produce death. There is a tension within every believer between the carnal nature and the Spirit. In a very real sense the believer is caught between two ages. As a son of Adam, he is subject to the law: that in Adam all die. Spiritually however, he has passed from death to life. The day will come when in the new age of glory, the tension between the two ages will be past. Paul cries out: “Who can set me free from the body of this death?” He longs to be free of this power working death in him, and it is this very question that he answers in chapter eight. It is through Jesus Christ that it is possible to be victorious, and be controlled by the law of the Spirit of life. Believers receive the first fruits, or pledge of the Spirit of God by which they know that one day they will receive the completed work (Romans 8:23, II Corinthians 5:5). There is coming a “day” when the world will enter a new era of blessing. Christ’s reign will last a thousand years and this is only a foretaste of eternity! It is a transitional period, and is an ever increasing growth of His power and glory through the whole world, when nations will submit to Him and even nature itself will share and benefit from the glorious liberty of God’s Sons and be brought into harmony and freedom. The entire creation will begin to enter into a new freedom from the suffering which came about by sin, and which brought decay and death. “The universe itself is to be freed from the shackles of mortality and enter upon the liberty and splendor of the children of God.” (Romans 8:21 NEB; Isaiah 11:4-10). When Jesus was transfigured, His face and clothes shone like the sun in its brilliance. This was a manifestation of His Shekinah Glory. This is what will happen at His appearing (epiphaneia) in His glorious light (I Timothy 6:14-16). He foretold that a new day, or “age,” will dawn when the morning star will arise in the hearts of the Lord’s people (II Peter 1:17-19). “Morning Star” comes from the Greek word “phosphorus,” meaning “light bearer.” It comes from “phos” meaning to shine, or make “luminous,” and “phero, to bear or carry,” which refers to the arising of the light of Christ as a personal fulfillment in the hearts of believers; and also, to His coming in glory to establish His Kingdom on earth. The reference to Jesus as the Morning Star, (pertaining to the dawn) endorses this theme (Revelation 22:16, 2:26-28). To those who follow Him, Jesus gave a promise that they will not only rule the nations with a rod of iron, but will also receive the “morning star.” Metaphorically, Jesus is the Morning Star, who one day will appear as the sun of righteousness, to govern the world in peace. He is the light who shines in the darkness and brings the Lord’s government into the world (Isaiah 9:1-7, John 1:4-9, Revelation 21:23,24). A new day will dawn when Christ’s light will arise and shine within believers. True believers already experience the indwelling Christ by His Spirit. One day, He will reveal Himself to those who fear His name, and then the righteous will shine forth (and be resplendent) as the sun in the Kingdom of their Father (Matthew 13:43). The “morning star” will arise and shine within believers. We read something similar in Daniel 12:3; that they will shine like the stars. Believers will appear with Jesus in glory. “Christ is our real life. When He comes back, you will shine with Him in all His glory” (Colossians 3:4 Simplified Living Bible). “When Christ, who is our life appears, then you also will appear with Him in (the splendor of His) glory” (Colossians 3:4 Amplified Bible). The word “appear” is “phaino,” which is derived from phos, “to shine.” People who saw Jesus in glory described Him as being brilliant light. When Moses saw God’s glory, he radiated that glory and his face shone so brilliantly that he had to cover it. He had experienced such concentrated exposure to God’s presence that he wore a veil. This glory faded, but one day, it will be permanent and believers will manifest Christ’s Shekinah Glory. Stephen, the first Christian martyr, reflected this glory, and his face looked like the face of an angel. Martyrs and faithful followers of Jesus will be given robes of pure white (Revelation 3:4,5, 18; 6:11). The word “white” is derived from the word for light, and is used to describe the brightness of Christ Himself, in His glory (Matthew 17:2, Revelation 1:14). Those who are faithful to Jesus will walk in the same whiteness, as pure as light, and not be found naked (Revelation 3:4, 5, 18). Just as God is arrayed in garments of splendor and light, so too His children will put on garments of pure white. Paul taught that believers will be clothed with immortality, and not be found naked (II Corinthians 5:1-4; I Corinthians. 15:53, 54). When Adam and Eve sinned, they lost their spiritual covering, and they knew they were naked. It is conjectured that prior to their fall, they were covered by the glory of God, which departed when they chose death rather than life and immortality. However, one day Jesus will restore believers to become like Him. Then, He will present to Himself His Church, glorious and without spot or wrinkle (Philippians 3:21, Ephesians 5:27). God’s people will shine with His Glory. “The Lord shall be their everlasting light” and they will be planted by the Lord for “the display of His splendor” (Isaiah 60:19, 20 and 61:3 NW Bible). After Jesus Christ rose from the dead, He remained on earth for forty days. During this time, He was visible on many occasions and appeared to believers. Although changed, He nevertheless had a real body, wore clothes, and ate and functioned with them. His own people could see and touch Him. He was fully fitted as a new man to remain on earth, if He had so desired. We have already seen how in the Old Testament, The Lord’s presence was in the Cloud which was His visible manifestation with His people. Not everyone could approach that cloud; but Moses was able to enter it, and when he did, he saw God, “face to face.” For forty days, he was with God in the cloud and when he came out, he radiated that glory so much that he had to cover his face (Exodus 34:30-33). In a similar way, believers were with Jesus for forty days in His resurrection glory. Not everyone saw Him; only believers. He appeared to them, and taught them many things. First, He revealed Himself to individuals, and then to more and more of His followers, but no unbeliever could enter His visible presence (Acts 10:40, 41). Paul gave a detailed account of the order of Christ’s resurrection appearances, and to whom He appeared. I believe there is a reason why He did so. Jesus first appeared to individual people, who desired Him more than anything else. Then He appeared to small groups of dedicated disciples. Finally, He appeared to the larger crowd. He made Himself visible, wherever and whenever He chose. He came and went at will, stepping between the visible and invisible realms. He was invincible, and as Thomas declared, “He is Lord and God.” He illustrated His perfect suitability to life on earth, and His ability to interact between the two realms. At the end of the forty days, we are told that Jesus was lifted up, and a cloud received Him out of their sight. We are not told how high He went. Contrary to the popular concept of Jesus rising high into the sky, He just lifted himself up and was immediately received by the cloud of God’s presence, into which He disappeared (Acts 1:9). This cloud was the “Cloud of God,” not a weather cloud. He did what He had been doing during the previous forty days, as He appeared and disappeared, except this time, He was lifted up in order to show that He was departing. As we will consider, heaven is not far away, but is another dimension close at hand, but invisible to the finite eye. It is said to be “up,” but this cannot be a physical direction, but is a spiritual elevation. When Stephen was about to die, he saw heaven opened and Jesus standing in the glory of God. He was not looking far up into the sky, but right in front of him. The veil, or curtain, was withdrawn so that he could look into the invisible realm. Heaven is in this invisible spirit dimension. When Jesus vanished, two angels suddenly stepped out of that dimension and appeared to the disciples. They had a message: “This same Jesus, which is taken up from you into heaven, shall so come in like manner, as you have seen Him go into heaven” (Acts 1:11). This same Jesus, who in His risen glory, came and went to His disciples for forty days in His resurrection body, will return in the SAME manner. In other words, this same Jesus who died on the cross, and rose again, will return in His risen body. He will come in the same way He left. At the time of His return, Jesus will simply step out of the “cloud” and once more be with His people. When He returns from the invisible realm, He will be visible, just as He was during the forty days. He will appear to all who love Him, everywhere in the world, simultaneously, if He so desires, to individuals, to small groups, and also, to large crowds. He may appear first to those who are seeking Him, as he did to Mary Magdalene. When Jesus comes, He will not be confined to an earthly body, walking the dusty roads of Israel, but will be in a risen body, anywhere in the world. He is God, is omnipresent, and has all the glory of the Godhead. He is also the risen man of glory, and as such will be perfectly fitted to live in the realm of earth. He will be invincible, and His disciples will be able to see Him, and meet with Him. Unbelievers will not be able to enter His presence, but believers will, and as they do, they will meet the Lord, Face to Face, just as Moses did long ago. They will see their King, and will be changed to be like Him, never to be separated from Him. For forty days, Jesus lived with His people in His resurrection body. He lodged with them, ate with them, and taught them about the Kingdom of God (Acts 1:4). During this time, He came and went with no restrictions, or limitations. He lived in two realms, the invisible and the visible, the material and the spiritual. God dwells in the invisible spirit realm or the “heavens,” which is not at the other end of the universe, but is in another dimension. Jesus must have had access to this realm, even as a young lad. He grew up seeing and hearing the Father in perfect communion (John 8:38). At times, God has allowed people to see into the invisible realm (Luke 2:13). Each time that “heaven was opened,” the veil was drawn aside and people were permitted to see things which were not necessarily far away, but right there in front of them, in the invisible “heavenly” realm. For example, Elisha saw an angelic manifestation when Elijah was taken up to God. Later, he prayed that the eyes of his servant might be opened to see the angelic army that surrounded them (II Kings 2:11, 6:17). These angels were not far off, but nearby in the invisible realm. In Hebrews 12:1, it is written, “we have so great a cloud of witnesses surrounding us.” This is the cloud of those people who have gone before us into the Lord’s presence; they surround us, not far away, but just beyond the veil. At death, Christians pass through the veil and enter into the presence of the Lord. At the approach of death, there is every indication that believers can see through the veil into the invisible realm, for they often respond as if someone is there. They sometimes reach out and even declare that they can see angels, loved ones, or the Lord Himself. (Psalm 23, II Corinthians 5:8, Philippians 1:23, II Peter 1:13-15). Angels can manifest themselves from one realm to another. When they do, they can appear as real persons who wear clothes and can be touched. Very often they radiate the brightness of the Lord’s glory, for they come from the presence of His glory (Matthew 28:3, John 20:12, Acts 1:10). There are different orders and levels in the angelic realm. Paul was caught into the “third heaven,” which indicates that there are different heavens, or spiritual realms. God has different kinds of angels: cherubim, seraphim, archangels and so on. There are also fallen beings: princes, principalities and demons. In fact, the whole problem of sin started with the rebellion of Satan. In Revelation, we are told of a war in “heaven” between Satan’s angels, and Michael’s angels. Michael is an archangel of God (Revelation 12:7-12). This war is not in the heaven where God dwells, for Satan was expelled from there long ago, but it takes place in the invisible spirit dimension, immediately adjacent to earth. Satan and his angels are cast out of that realm onto the earth, and this is followed by a short time of conflict. During this period, angelic activity will become very intense, and it is very probable that people will see more and more spiritual manifestations of one kind or other. Even as I write, there are amazing reports of things that have occurred. The world is being prepared for a spiritual conflict. Intense dissemination of all kinds of supernatural phenomena is taking place through TV and literature. Aspects such as astral travel, becoming invisible, out of body encounters, UFO’s and such like, have been promoted and even experienced by many. These are counterfeits of the real power of God. Christians, on the other hand, are also seeing visions, angelic visitations, and spiritual revelation; which will increase more and more as the barrier between the spirit and material realms is removed, and allows them to function like angels. Jesus said to Nathanael that he would see the heavens opened and the angels of God ascending and descending on the “Son of Man.” Jesus Christ is the true ladder, or stairway into heaven. The word “highway” in Isaiah 40, means a viaduct, or “staircase,” that allows entry into the Lord’s glory, which will be revealed to all who come on this highway. It is Jesus Himself, who is the way, and opens the heavens to allow entry. He is the one door and only true mediator into God’s realm and glorious presence. He is the “ladder,” or link between the two realms (John 1:51, Genesis 28:12, Isaiah 40:3-5, 62:10). On the day that Jesus returns, He will simply step back from the invisible. Weymouth’s translation puts it well, “on the day that the veil is lifted from the Son of Man” (Luke 17:30). Paul wrote that we eagerly await the revelation or unveiling (apokalupsis) of our Lord (I Corinthians 1:7). He can come at any time! When He does, He will be real; as real as He was to Thomas. There is a “veil” that hides the spirit realm. Before Adam sinned, he had perfect communion with God, but after his fall, he only heard His voice. The veil will one day be removed. Through His resurrection, Jesus will forever destroy the veil that covers all nations (Isaiah 25:7-9). At present, we look through a “glass,” but one day we shall see him “face to face.” Until then, “we all, with open (or unveiled) face beholding as in a glass (or mirror) the glory of the Lord, are changed into the same image, from glory to glory” (II Corinthians 3:16-18; I Corinthians 13:12). Are we approaching the time of the inauguration of the reign of Jesus Christ on earth, and the establishment of His Kingdom upon the nations of the whole earth? It cannot be far off. One day, that moment will come when the saints will possess the Kingdom (Daniel 7:18, 22). Then the Scripture will come to pass, “The kingdoms of the world have become the Kingdom of our Lord, and of His Christ, and He will reign forever and ever” (Revelation 11:15). His Kingdom is coming in power and great glory. No one will be able to resist or oppose it. It will be a complete and total victory; an overthrow of Satan’s kingdom. Then, there will be a huge harvest - millions will turn to Christ. John described this when he saw the “son of man” (the unique title of Christ) on a cloud, crowned with a golden crown, reap the whole earth (Revelation 14:14-16). God has, through His people, established a worldwide net which will bring in the greatest ingathering of the ages. At daybreak, on the shores of Galilee, the risen Christ called out to His disciples to cast in the net, and they then caught a catch so big that they could hardly land it. This was a preview of what is to come (John 21:1-6). Get ready, it is harvest time! As High Priest, Jesus will appear a second time to all who love Him, and are looking for Him (Hebrews 9:24-28). God has called a chosen people, a Holy Nation, a Royal Priesthood of believers (I Peter 2:9). Jesus, the High Priest, made Atonement for them (Romans 5:11, Hebrews 9:24-28). One day, the Lord Jesus Christ will reveal Himself to His own special people; all those who love Him and look for Him. Just as Joseph revealed himself to his brothers behind closed doors, so Jesus, after His resurrection, revealed Himself to His disciples (John 20:19, Genesis 45:1). And He will do so again. He will suddenly appear to every person who is surrendered to Him, and has made Him Lord. He will receive them and embrace them with great joy, and they will enter His presence with rejoicing (Matthew 25:21). Then He will be marveled at by all who believe (II Thessalonians 1:10). The word “marvel,” or “admire,” comes from a verb which means “to look at closely, to look upon and behold.” Just as the early disciples were able to touch Him and handle Him, even after His resurrection, so too His people will be able to see Him, embrace Him, worship and admire Him (Matthew 28:9; I John 1:1; John 20:27-28). In that day, there will be a deep union with Him which will never be broken. He will come into those who have opened their door to Him. They will enter His presence “within the veil,” and the door will be shut (Revelation 3:20, Matthew 25:10). They will emerge from their appointed meeting with the Lord Jesus Christ, as a race of new people, to control a new era, and a new world. Instead of being taken away from the world, true believers will be empowered to win the world, and then rule it for Jesus Christ. Jesus gave certain signs, which indicate that “He is near, right at the door” (Matthew 24:33). These signs are evident everywhere. Jesus is standing very near, just on the other side of the veil, right at the door. Soon, He will open it and step back into the visible realm to reveal Himself in Glory to those who love Him, and are ready to receive Him. He will return to earth, and once more walk upon it as KING OF KINGS. This section is to anticipate questions that may arise, and is for further study by those who would like to explore Scriptures that verify what has been said. If we carefully consider the Lord’s teaching, it seems that believers are not taken away when He comes, but remain on earth in order to enter His Kingdom. In His teaching, Jesus indicates that at the time of the Kingdom, there will be a cleansing on earth (Matthew 13:30-50). Jesus said that the tares will first be gathered and burnt up, then the wheat gathered. He said at His return, or “presence,” some would be taken away, not in rapture, but in judgment; one from a bed, another from a field, yet another from the work-place. In its context this is not a rapture of believers, but a judgment on the wicked. Those who are taken away are taken in judgment, just as the flood took people away at the time of Noah. His reference to vultures confirms this as judgment from God, and comes from a figurative description by the prophet Ezekiel of the great “judgment supper” of God (Ezekiel 39:17, Revelation 19:17). Those who are taken are the wicked, and not the righteous. Those who remain enter His Kingdom, and inherit the earth. Jesus also spoke of those who may try to enter His presence at His return, but will be turned away and prevented from doing so, because they never really knew him. The judgment of nations at this time also indicates that some will enter the Kingdom, but not all (Matthew 25:11, 12, 30, 41). The Old Testament prophets foresaw the Kingdom of God filling the whole earth. Like the mustard seed, it will eventually fill the entire earth (Matthew 13:31). Jesus will rule the nations and His people will be changed, and empowered to rule with Him. Then peace will fill the earth when the wicked are removed, the nations converted, and Jesus rules. What is sometimes called the “rapture” is in fact not a departure, but a meeting with the risen Jesus here on earth, at His return. At this meeting, believers will be changed to allow them to function in a new way, with no restrictions, and great power. His Kingdom will bring the spiritual and material realms into harmony, and believers will have access to both. The emphasis in Scripture is on the return of Jesus. He is coming back, not to depart again, but to remain with His people - for a prolonged period, during which time He will subdue the nations, and establish His Kingdom on earth. Many things that are initiated at the time of His return are completed during this period, or at its culmination. In this way, it sometimes appears that there is a double fulfillment to some prophecies, one partial and then one final. When the apostle Peter wrote about the “Day of the Lord,” or Christ’s “Parousia,” or “presence,” he said that a day with the Lord is like a thousand years, and the apostle John also said the reign of Jesus would last for a thousand years (II Peter 3:3-13, Revelation 20:4). His coming “Parousia,” or “presence,” will usher in the Kingdom of God. It is not the end of the world, but the start of a new era, during which His Kingdom fills the whole earth. When Jesus returns, His “presence” will be felt everywhere, from east to west (Matthew 24:27). Contrary to popular interpretation of this verse, it does not necessarily mean that everyone in the whole world will see him come like lightning, but that His return will be to the whole world. Jesus did not mean that He will come like lightning flashing across the sky, but that just as lightning is universal, so also will be His “presence.” He is not referring to a public display, but to a universal presence. Just as lightning is not confined to one spot, but extends from east to west, so too His presence will not be confined to one spot, but will be just as widely felt. At His presence, there will be no need to seek Jesus in private chambers, or go to the wilderness to find Him, for it will be as universal as the lightning, which lights up the east to the west. In other words, it is not a localized event confined to one particular place or group, but in His risen body, He will be able to be anywhere in the whole world. It will also be unexpected, in that many will not be prepared for it. Consequently, some people are taken away, not in a rapture, but in judgment. The resurrection is the hope of all believers. 1. Jesus, the first fruits. 3. Then the end will come, but only after Jesus has abolished all other rule, authority, power, and finally, death itself. There is a clear step by step strategy outlined here. It is generally accepted that there is an order in the resurrections, and that although one day there will be a universal resurrection of the dead, there is also the promise of a resurrection for believers, prior to that time (Revelation 20:4,5; John 5:25-28; Luke 14:14). 1. Jesus is the first to rise from the dead. When Jesus arose, multitudes of departed saints became visible (Matthew 27:51-53). This was the first-fruits of God’s harvest. The living saints were then empowered, or “clothed,” by the Holy Spirit, and a spiritual explosion resulted that thrust the gospel into the world. 2. Secondly, there are those who will belong to Jesus at His “Parousia.” They comprise two groups: the first, are the deceased saints, who have died between His departure, and His return, and who will be raised. The second, are those who are alive at, or during His “presence” (I Thesalonians 4:13-5:10; I Corinthians 15:51-53; Revelation 20:4,5). (a). Believers who have died, will come back with Jesus when He returns. They will be “raised” to become active again. They are with Jesus, and will accompany His return. The apostle Peter declared that he would one day lay down his earthly tabernacle - his physical body, and depart to be with the Lord (II Peter 1:13-15). The apostle Paul spoke of putting on, or being “clothed” with the heavenly body, so as not to be found naked. The word clothe is “enduo” - to sink into a garment, invest with clothing, or endue. According to II Corinthians 5:1-6, departed Christians are not just floating around somewhere, but are clothed in new heavenly bodies. When Jesus returns, they will return and reign with Him (Revelation 20:4). Like the multitudes that appeared after the resurrection of Jesus, they will be able to become visible and function in their glorified bodies. (b). Believers who are alive on earth, at the “Parousia,” will be changed (Strong’s), which means “to make different,” or (Vines) “to make other than it is, to transform.” Living believers will be changed to share the glory of Jesus at His return. This does not necessarily take place all at the same moment, but at the sound of the trumpet. Yet no trumpet sounds momentarily, but is an extended sound. The trumpet (the voice of the Lord - Revelation 1:10) sounds for each individual who belongs to Jesus, and as it does, He will reveal Himself to them. This transformation releases God’s power into them, and a worldwide explosion of God’s reign follows. 3. Christ’s “presence,” or “being alongside,” will release His Kingdom and power into the world, and for a thousand years, it will grow and fill the whole earth. At the end of this period, Jesus will submit the Kingdom to His Father. He will reign until He has put down every enemy. The last enemy to be abolished is death (I Corinthians 15:24-26). Death is only finally abolished at the end, but during this period, His people are already experiencing His glory. There is something of a mystery about the life of Enoch. He walked with God, and had a testimony that pleased Him. One day, God took him and he “was not.” He was translated, or transferred, into God’s Kingdom. He walked with God, right through the “veil” into His presence. Enoch prophesied that Jesus, and all those with Him, will return to earth. When Jesus steps back from this veil, people on earth, who belong to God, will enter the “presence of His glory” with great joy, and share in His majesty, power, and authority (Jude 14, 24, 25). Then like Enoch, they will have access to God’s presence and enter through the veil, without dying. In I Corinthians 15:51, Paul described a “mystery.” It was not openly revealed, but only understood through the Spirit of God. He chose his words very carefully when he said that “this corruptible (subject to death) must put on, or be clothed with incorruption (unending existence)” and that “this mortal (living) shall put on, or be clothed with immortality (deathlessness).” The dead will be raised, and the living changed. Jesus confirmed this (John 11:25, 26). The apostle John wrote that when we see Jesus, we shall be like Him (I John 3:2). Paul taught that Jesus will transform the state of our humble body, and conform it to the body of His glory, by the exertion of the power that He has to subject all things to Himself (Philippians 3:20, 21). There is coming a quickening, an energizing in the Spirit, which will enable the born again believer to break forth beyond the bounds of the restrictions of the physical body, which will be changed and conformed to Christ. When Jesus reveals Himself to a person, they will take on the same life that He has. How will He reveal himself? Will it be similar to His resurrection appearances, when He showed Himself first to those who were seeking Him, then to others who belonged to him and afterwards to the larger crowd? This is certain – Jesus will personally reveal Himself to every person who loves Him, and is looking for Him (Hebrews 9:28, John 14:21). The Amplified Bible says that Jesus will appear to those who “eagerly, constantly, and patiently wait for Him.” However, to God haters, His return will be “with mighty angels in flaming fire to bring everlasting judgment... away from His presence and glory” (II Thessalonians 1:6-10; Isaiah 66:15, 16). They will not see His glory, or stand in His presence. As the Living Bible puts it, “They will never see the glory of His power,” and the NTV Bible says they will be “shut out” from the presence of the Lord, and from the majesty of His power. His appearance in splendor will take place at His “Parousia,” at which time the wicked are destroyed (II Thessalonians 2:8). This endorses the parables of Jesus concerning the removal of the wicked, and the remaining of the righteous to enter His kingdom. The “beast,” and the “false prophet” will be seized, and Satan will be bound (Revelation 19:17-20). These verses are a figurative description of the great judgment supper, when vultures gather to devour the wicked. In that day, Jesus will be glorified in His saints, and marveled at by all who believe (II Thessalonians 1:10, Isaiah 66:18). When Jesus returns, true believers will be revealed, having His same glory! (Colossians 3:4). The wicked will be destroyed, and will not see Him, but the rest of the people who remain will know that He has come, because they will see His glory revealed in His true followers, who will be immortalized! This is the “manifestation,” or public revelation of God’s sons. What does this mean? The apostle John wrote to believers and quoted two Old Testament Scriptures: Daniel 7:13, and Zechariah 12:10. The one tells of the power and glory of Jesus when He establishes His Kingdom in the world, and the other, of the conversion of Israel. The apostle John used these two Scriptures to describe the day when Christ’s Kingdom will come, and all tribes of the earth will repent. He wrote that “every eye” will see Jesus. This is the purpose of God - that all mankind might come to Him. This is progressive. God gave a promise to pour out His Spirit upon all flesh. This does not mean it will happen to every single person, but rather that it will happen to all who come to Him. It is an on-going process. The day will come when every believer will see Him, and all the tribes of the earth will repent, as His Kingdom is established throughout the whole world. As people repent and believe, they will be born again, and also, be able to enter into His presence and see Him. As more and more people come to Jesus, so that “every eye” shall see Him, until eventually His glory will fill the whole earth. He will rule as King of kings and Lord of lords. One day, all nations will see His glory, and bow before Him (Isaiah 66:18, 23; John 3:3). John saw the Lord on a white horse, making war against the wicked (Revelation 19:11). Does this mean that Jesus will come galloping across the sky? Not necessarily. These are figurative terms which describe His power and status. Great warriors rode on white horses as a symbol of their rank. From out of the mouth of the Lord came a great sword. This can hardly be literal, but illustrates His authority in that the Word of God is the sword of the Spirit (Hebrews 4:12, Ephesians 6:17). The book of Revelation is filled with symbols and figures, and in this way describes the Lord returning in power to conquer the world. In Revelation 1:10-18, John described how, being “in the Spirit,” he saw the glorified Lord standing in the midst of the candlesticks, or Churches, His face shining like the sun. Then, after hearing the messages to the seven Churches, John entered the realm of the Lord and described the glory of God in similar terms as Ezekiel (Ezekiel 1:1; Revelation 4:2-11). John saw and entered the Shekinah glory of Jesus, and was in the very presence of that Glory. John was not taken in rapture, but was “in the Spirit,” and entered the heavenly realm. Later, he described how the temple of God in that realm was opened, and the ark of His covenant (a symbol of Christ) appeared. Again, he described the temple being filled with smoke from the glory and power of God (Revelation 15:8, 11:19). These terms describe events that effect the spiritual temple of God, His people. John also said that Jesus will come “in the clouds.” Jesus used these very terms when He spoke to the high priest and said that from that time on, he would see Jesus sitting on the right hand of power, and “coming on the clouds of heaven” (Matthew 26:64). He quoted from Daniel 7 and used the terms that the high priest knew referred only to the Messiah. This coming started on the day of Pentecost, and is applicable to the whole Church-Age. During this time, many revivals have swept through the world as the “clouds” of God’s presence have come, again and again in Holy Spirit outpourings, until one day Jesus Himself will stand among His people. His power has been coming ever since, and will continue to come, until the whole world bows the knee to Him. Over the last two thousand years, God has established His Church throughout all nations and through His people, He will one day rule over them. As the Holy Spirit hovers like a cloud over the Church in ever increasing power, the day will come when Jesus Himself will return and be visible in the temple of His people, in His Shekinah Glory. Acts 15:16-18; Galatians 6:16, 3:7,29; Ephesians 1:22, 23, 2:19-22; I Corinthians 3:16, 17, 6:19, 12:27: II Corinthians 6:16; Philippians 3:3. God is preparing His people, Spiritual Israel, for Christ’s glory. During the last week of His earthly life, Jesus entered the temple and cleansed it, and then was present within it every day, teaching and healing the sick. This is a shadow of things to come. The true Church is comprised of every blood-washed believer. It is not a denomination, but a living temple or tabernacle. Jesus alone cleanses it, lives in it, and prepares it for His coming reign in glory. Each Christian believer is a tabernacle in which the Lord Himself indwells, by His presence. He cleanses the temple and indwells it (II Corinthians 6:16-18; 5:14). 2. Through repentance, refreshing comes from His presence (present). The Church is the “Temple of God,” raised up among the nations. It is His body established in all the world. It is like a city built on a mountain, the mountain of God, shining with the light of the glory of God – “the Zion of God” (Hebrews 12:22; Isaiah 2:1-4, 60:1-3). The Lord Himself is central in the Church, and will come suddenly to fill it with glory (Malachi 3:1; Haggai 2:7-9). Any idea that a brick and mortar temple has to be rebuilt is not necessary. The true temple is the people of God. The Church is built by Jesus and set in order by His Holy Spirit. He sets each member in the Church, and sets His order and authority within it (I Corinthians 12:11, 18, 28; I Peter 2:5). As God cleanses, restores, and establishes the latter-day spiritual temple, its glory will exceed that of the former temple. And just as the Cloud filled the Tabernacle and Temple of the Old Testament, so Christ’s presence will fill His Church at His return. As Isaiah the prophet declared, the day will come when His glory will be like a canopy over Zion; for the Lord will come and rest on the whole stretch of Mount Zion, and on those who are gathered there. There will be a cloud and smoke by day, and at night the brightness of a flaming fire will be over all. The glory of the Lord will be like a canopy and a tent to give protection and shelter (Isaiah 4:5,6 Jerusalem Bible). His Shekinah Glory will rest on Zion, His people. When Ezekiel saw this coming restoration, he said that the earth shone with the glory of God (Ezekiel 43:2). Why did Peter suggest building three tabernacles, when he saw the Lord’s “Parousia,” or “presence,” and the cloud of glory, on the mount of transfiguration? Peter wanted to celebrate the Feast of Tabernacles, or in other words, the coming of the Kingdom of God, which the feast portrays. What he saw made him think that the Kingdom had arrived. However, what he saw was only a preview of what will happen, when the visible presence of Jesus comes again. Then Jesus will be present with His believers, and they will share His glory in His Kingdom. Jesus will “tabernacle” with them, and the Feast of Tabernacles will find its perfect fulfillment – Jesus with his people. The Feast of Tabernacles follows after the Day of Atonement, which is the foreshadow of His return. Jesus, the High Priest, will step back from the invisible realm and “tabernacle” with His people. A preview of this was seen at the Feast of Tabernacles when God filled Solomon’s temple with the cloud of Glory, which then continued to abide in the temple (I Kings 8:10). The final fulfillment is when “I will dwell in them, and walk in them” (II Corinthians 6:16). It is God who indwells His people by His Spirit, and this is a foretaste of the eternal state of perfection when, “the tabernacle of God” will be among men, and He will dwell with them. There will be no more pain, suffering or death, and they shall see His face, and reign with Him forever and ever. The plan of both the Tabernacle and Temple illustrates the spiritual path into God’s presence. There was only one door which led to the altar. From there, the shed blood was taken into the Holy Place where the priests daily ministered to God. Once a year, the high priest stepped through the veil into the inner sanctuary, the Holy of Holies, where the Shekinah Presence of God abode. The route into God’s presence has not changed. There is only one door to enter, one sacrifice to trust in, and one God to come to. We are told that these things are types and shadows of reality (Hebrews 8:3-5). When Jesus died, the veil in the Temple was rent, showing that the way into the presence of God was opened. Access is only possible to those who have been washed in the blood of Jesus. Through His blood, believers can, in a spiritual way, pass through the veil and enter the presence of God (Hebrews 9:3, 12, 24-28, 10:19-25). By maintaining pure fellowship with Jesus, believers can constantly live in the presence of the Lord, “within the veil.” In the Old Testament, the presence of God was displayed in the “cloud,” which came to abide within the veil of the Holy of Holies. The actual cloud may no longer be visible as it was then, but the presence of God is still real and can be felt. In fellowship with Jesus, believers experience the constant presence of God dwelling with them. In fact, at conversion, Christ Himself enters and INDWELLS the believer by His Spirit. The believer is then able to walk in the light and fellowship of God (Romans 8:9; Colossians 1:27; I John 1:1-2:6). From time to time, some people have actually seen the Lord, and the day will come when at His “Parousia,” His presence will visibly appear, and believers will see Him, face to face, in His Shekinah Glory. The “revelation” of Jesus Christ is from a Greek word, “apokalupsis,” meaning “uncovering,” and is closely akin to “apokalupto,” which means “to unveil” (Romans 8:19; I Corinthians 1:7; II Thessalonians 1:7; I Peter 1:7, 13). At His “Parousia,” the veil will be removed and Jesus will again become visible to believers who will then be able to enter and share His Glory. His people will have access to the spirit realm and like angels, will be able to enter through the veil into His presence. Immanuel, “God with us,” will tabernacle with His people, and they with their Lord. They will know His constant presence and have permanent access to Him. He will have returned, just as He promised and will set up a Kingdom, which will grow in power and glory. His Kingdom will be unlike anything previously experienced. Jesus said that there are many “dwelling places” in His Father’s house, and that He would prepare a place for believers. The main focus of His teaching is that believers will be united with Him, just as He and His Father are one. Those who love Him will also be loved by His Father. He declared that both the Father and Son will make their abode, or “dwelling place,” in the believer. He emphasized that He will “come again and receive them to Himself'.” Where He is, there, they will be also. The emphasis is unity with Jesus, wherever He is, whether in heaven or on earth (John 14:1-11, 20, 23, 17:20-24). In the closing chapters of Ezekiel, the prophet described the time when God’s Glory will fill His temple, and He will dwell among them (Ezekiel 43:1-7). In the final verse of the last chapter of Ezekiel, the prophet made a significant statement. After describing the city of God, he declared that its new name will be “Jehovah Shammah,” the "Lord is there" (Ezekiel 48:35). The Lord will permanently abide with, and be at one with His people. Christian believers may seem small and insignificant, but they are citizens of God’s kingdom. When the King returns, His people will become the most powerful people on earth, who will rule and reign with Him. The “mustard seed” of God’s Kingdom will one day grow and fill the whole earth. There will be no room for false religions, or cults. The days of denominations will be over. The only thing that will count is where the King’s presence is manifest in the Tabernacle of His people, which will be set in order to contain His power and glory to judge the nations and teach the world the righteous acts of God. His power will be released into His people, who will take control of the world. Great miracles, healings, and conversions will take place. As His Kingdom grows, it will fill the earth and all nations will come under its authority. This will include Jews, Muslims, Hindus and every other nation (Daniel 7:14, 18, 22; Revelation 11:1, 15, 12:10, 5:10). Jesus said that at His “Parousia,” there would be a “sign in the sky” (Matthew 24:30). This is not necessarily a physical phenomenon up in the atmosphere, but is something of great spiritual significance. In Revelation chapter 12, there is a great “sign” in heaven, which is described symbolically as a woman clothed with the sun, moon, and stars. Many believe it portrays the nation of Israel, from where the Messiah came in the flesh (Genesis 37:9; Psalm 89:34-37; Jeremiah 31:35-37, 33:24). Jesus also told the parable of the fig tree, which many Bible scholars believe portrays the earthly nation of Israel, and in which Jesus described both their scattering, and their regathering (Matthew 24:32; Luke 13:6; Luke 21:20-33). Many Bible scholars believe that the rebirth of the nation of Israel is the sign that God is about to intervene on earth, and that a remnant of God’s ancient people will receive Jesus as their Messiah. God has always used the nation of Israel to show forth His dealings with mankind. In the past, God dealt with the Jew first, and then the Gentile. If we are coming to a time in which God is to deal with the nations, it will be with His ancient nation, first. God has not totally cast them away, but will restore those who come to Him. Jews who seek God will come to realize that the one who was crucified is their Messiah. A remnant of the nation will repent and turn to Yeshua, and then the true “Israel of God” (both Jew and Gentile believers in Jesus) will be complete. If their rejection meant the reconciliation of the world, then their acceptance will bring life from the dead (Zechariah 12:10-14; Romans 11:15, 23-29, 9:24-27; Galatians 5:6). Is the Lord coming to the Mount of Olives? (Zechariah 14:4). Although many Bible believers look for this as a future event, some consider these verses to have been fulfilled when Jesus came the first time. After Zechariah wrote this prophecy, Jesus has indeed stood on the Mount of Olives, and Jerusalem experienced the most horrific destruction when the Romans, with soldiers from many nations, laid siege to it. Zechariah described the mountain cleaving in the middle to provide a way of escape. Many Old Testament prophets used figurative terms to convey their message - for example mountains will be removed, or flattened at the Lord’s coming. Since then, Jerusalem has indeed been trodden under foot by nation after nation, but one day these very nations will serve Jesus (Zechariah 14:16). I believe Jesus will visit those of His ancient people who are seeking their Messiah, and that survivors in Israel will be the first earthly nation to repent when Jesus returns and enters His earthly reign. However, when Jesus returns, His presence will be felt universally, and will not be limited to one place. He will be King over all the earth. He calls all nations to repent and get ready - He is coming (Zechariah 14:9; Psalm.2; Romans 11:15). Are we in times of refreshing and cleansing in preparation for the coming restoration? In chapter 11 of Revelation, we read of a period of three and a half years during which time there will be a powerful ministry by two prophets. Many Bible scholars see this as the restoration of the Elijah ministry. The prophet Elijah ministered for a period of three and a half years, ending with a mighty conflict between the false prophets and God (James 5:17). His ministry called the people back to God. When Jesus came the first time, He also ministered for a period of three and a half years, during which time He called people to God and prepared them for what was to come. There is another period foretold of three and a half years in which God will demonstrate His power. This end time is designated as three and a half years, and not seven. Both Daniel and the apostle John refer to a future time of only three and a half years (Daniel 12:7.11; Revelation 11:2, 12:6, 14, 13:5). The two prophets of God will have great power, and although resisted by Satan and killed, they will rise in victory after three and a half days, and enter the “cloud” of God. Just as there was a period of three and a half years to usher in the Church Age, so there is a period of the same time to usher in the Kingdom Age. During this period, God’s prophets will declare His word with great authority. In the days of Moses, God tolerated Pharaoh in order to demonstrate His own power. Pharaoh was no match for God, who delivered His people with a display of incredible power. God will again intervene, and once more reveal His Glory. So much prophetic teaching has emphasized the coming of Anti-Christ, that people have forgotten the true coming of Christ! Something amazing is going to happen during these last three and a half years! There will be a supernatural intervention by God in the most amazing manner! There is not going to be seven years of tribulation. This idea comes from a popular interpretation of Daniel's vision in Daniel 9:24-27, but not everyone is agreed as to its meaning. There are numerous thoughts as to how this vision should be interpreted. Some people believe that an "antichrist" will make a treaty with Israel for one week, of seven years. It is a difficult portion of Scripture, but a careful reading of the vision in its proper context indicates a far more likely interpretation as the Messiah Himself, who is the person who confirms the covenant for one week of seven years. The meaning of Daniel's vision in Daniel 9:24-27 is to show us Christ and not antichrist! "Then he (Jesus) shall confirm a covenant with many for one week (7 years); But in the middle of the week (after 3 and ½ years of ministry) He shall bring an end to sacrifice and offering (by offering Himself for the sins of the world)." When Jesus started His ministry this week of seven years began, and was then cut in half at His death three and one half years later. The remaining three and one half years of this seven year period, will be fulfilled at His second coming. There are different opinions as to when Jesus started His ministry, but at the time when the Holy Spirit came upon Him, and anointed Him, showing Him to be the "Messiah, or Anointed One," Jesus then fulfilled the first half of Daniel's "One week," by His own three and a half year ministry, during which time He "confirmed the covenant" of God. In the middle of this week, He established the New Covenant, and then died on the cross. He put an end to all sacrifice and offering by the supreme sacrifice of Himself. The person who makes this covenant is the "Prince-Messiah," who is the major subject of the vision, and not an antichrist who is the minor subject. The "He" is a reference to Jesus - the "Coming Anointed One." It is not the anti-Christ, but the Christ who confirms the covenant, which is not a so called "peace treaty," but the covenant of God. Jesus ministered for exactly three and a half years; something many Bible scholars seem to ignore! He Himself fulfilled the first half of the seven years by His ministry of preaching and teaching the Kingdom of God, and He will Himself fulfill the second half by confirming the covenant again. Whichever way one considers the vision, the Scriptures tell of a period of only three and a half years, and contrary to much teaching about it, the emphasis during this time is not on the devil's power, but on God's. As they enter the protection of His “presence,” the angels will go through the whole earth removing all things that offend (Isaiah 26:19-21; Matthew 13:39-40). The prophet Isaiah foretold that when the Lord “comes out of His place” to punish the earth, there will be a resurrection, and that at that time, God’s people will enter their inner rooms, close the doors, and hide from the judgment that will come upon the whole earth (Isaiah 26:20). The Passover meal, which became the “Lord's Table,” portrays something very special. When Jesus partook of the Passover, He said that He would not drink the cup again, until He drinks it new in the Father’s Kingdom. There were a number of cups during the meal. The third cup was known as the “Cup of Redemption,” which is probably the cup that Jesus shared with the disciples (Luke 22:20). It seems that He refused to drink the fourth cup, known as the “Cup of Consummation” (Mark 14:25), and which recalled the promise that God would take His people unto Himself. The unfinished meal of Jesus was a pledge that redemption would be consummated at the future Messianic banquet, when He takes the cup, and drinks it new in the Kingdom of God. Each time Christian believers eat and drink from the Lord’s table, they show His death “until He comes” (I Corinthians 11:26). The meal points to His return, and the deliverance He brings, at that time. Jesus Himself is the Passover Lamb, who shed His blood, and by doing so fulfilled numerous shadows and prophecies concerning the Passover. For example, He died at Passover without a bone being broken, just as the lamb itself had no bones broken in it. After His death, blood sacrifice ceased. It is evident that Jesus fulfilled Passover, and those who eat and drink of Him, receive His life (John 6:51). He will also return to complete its full outworking. At that time, Jesus will meet with His loved ones “behind closed doors,” and the angels will go through the world and destroy the wicked. The prophet Zechariah wrote that when Messiah reveals Himself to Israel, it will be to family units set apart. This indicates that Jesus will disclose Himself as the true fulfillment of Passover to those who are looking for Messiah, in small family type groups. Jews are not saved because they are Jews, but must receive Jesus Christ as Lord. Through the Passover, their eyes will be opened to understand who Jesus is. They will “see” the wounds in His hands, and know that He is Lord, King, and High Priest (Zechariah 3:8-9, 6:12-13, 12:10-14, 13:6, 14:16). In ancient days, the Passover began as a family festival centered in the home. Later, it became a pilgrimage festival when adult men went up to the temple in Jerusalem. After the Romans destroyed the temple, it returned to the family in the home. The Rabbis have since taught that each person is to consider himself a temple, and pray the true sacrifice. Prayer, righteousness, and repentance became the emphasis. Even to this day, devout Jews still keep the Passover. They have some interesting customs in the Passover “Seder,” or ceremonial meal, which must surely point to the coming Messiah. There is a cup called Elijah’s cup, which is on the table, but not drunk from, which looks to the day he will return as herald of Messiah. However, Elijah is only a type and forerunner of the Messiah, a shadow, who points to the Messiah Himself. In the meal, the unleavened bread is arranged in three divisions. The middle part is taken, broken and then hidden somewhere in the house. Later in the meal, it is looked for, taken out and revealed. During the meal someone will get up from the table and go to the door to see if Elijah, the herald of Messiah, has come. These are reflections of spiritual truths. Could it be that one day those who are praying for Messiah, the Lord Jesus Christ, will open their door and find someone standing there? And if they invite him in, will He reveal Himself to searching hearts, just as He revealed Himself to the two disciples at Emmaus? After all, the Messiah is the central focus of the meal; and the bread and wine are symbols of Him, both of His death and His return. There is no question that the feast looks towards His coming. God will be King over every nation on earth. The time will come when He will cleanse all nations (Matthew 25:31-46). The return of Jesus is prophetically also portrayed by the Feast of Atonement. In contrast to Passover, which was centered around the individual and family, the feast of Atonement was a day of national repentance and atonement. The Passover covered the sins of the individual, whereas at Atonement, the high priest took the sacrificial blood and interceded for the entire nation. As the prophet Zechariah predicted, both offices of King and High Priest will be combined in Jesus (Zechariah 6:12, 13). He will cleanse all nations on earth, and the people in them who cause offense will be removed, and He will rule over them as King. The angels will remove everything offensive. As one considers the present world turmoil, one must realize how imminent this judgment must be. Peter placed the final purging of the world, and the start of the new heavens and earth, as occurring on the day of Jesus’ Parousia, or presence. In the context of this teaching, he wrote that the Lord likened a day to a thousand years. John placed the new heavens and earth at the end of the thousand years rule of Jesus. It seems, therefore, the Day of the Lord’s presence commences at His return, and lasts a thousand years, during which time He rules the nations, subdues all His enemies and ushers in a new heavens and earth (Revelation 20:2, 5, 21:1). Just prior to the new heaven and earth, at the end of the thousand years, there is the final battle when Satan is released from prison, and gathers all who disobey God. They “come up, or out” of the earth to resist God (Revelation 20:7). The language conveys something of great proportions. It is the final great rebellion of all who follow Satan, and hate God. They arise from the “four corners in the earth,” and follow Satan in a final attempt to frustrate God’s purposes. It has been suggested that, being the time of the general resurrection, the vast multitudes of wicked men and women of all centuries and nations, who would be coming to life, would follow Satan in this last futile rebellion. The apostle John describes them as Gog and Magog, and draws from Ezekiel’s prophecy to foretell the destruction of those who resist Jesus at His return, and also at the climax of His rule. He places the complete fulfillment of this prophecy at the end of the thousand years rule of Jesus (Ezekiel 39:17; Revelation 19:17, 20:7). This final rebellion only lasts a very short time, and is quickly subdued. Satan and all with him will be defeated, the earth purged, the last judgments take place, and the eternal order established. Creation comprises both the spiritual, and the material, and the gulf between them is an unnatural gulf which tortures it. In His resurrection, Jesus showed that both realms will be reconciled, and the barriers between the two will be removed with the spiritual controlling the material in a new way (Colossians 1:13-23). There is coming a new heavens and earth, in which righteousness dwells, and in which sin, suffering, decay and death, can never recur. Peter described this when he wrote that this present world and all its works will be dissolved and burnt up. In the context of his epistle, he is referring primarily to the wickedness of this present order. He used God’s previous judgment at the flood as an example of the future purging. It is not necessarily a total destruction of everything, but it is most certainly a catharsis and total renewal and rearrangement, even of the elements, or principles that hold it all together. The writer of Hebrews put it most eloquently when he wrote that this present order will be folded up like a garment, and be “changed.” This is the same word used in I Corinthians 15:51, 52 - “To make different.” Jesus will renew and make perfect the whole of creation, removing the prospect of sin ever spoiling it again (Hebrews 1:10-12; II Peter 3:7-13; Revelation 20:11, 21: 1). God’s people will play an important role in the new order. In His parables, Jesus indicated that those who are faithful to Him will be rewarded with greater responsibilities. They will judge the world, and even angels. Jesus will empower His people to rule the world, and His Kingdom will never pass away (Ephesians 1:17-23; Matthew 24:45-47, 25:14-30; I Corinthians 6:3). Throughout the Scriptures, the union between God and His people is likened to a marriage. This concept originated in the Old Testament when God said He would marry His people. It is continued in the New Testament, where the Church is considered as a Bride of Christ, and the individual believer to be married to Christ. The marriage union is considered a figure of the union between Jesus and His Church. It is consummated in Revelation, where the eternal city, New Jerusalem, is portrayed as the Bride of God. In marriage there were certain Biblical customs which served to portray Spiritual truth. In His parables, Jesus drew from these customs. Paul did too, and wrote that the believer is betrothed to Christ. In fact, the betrothal was itself a binding contract. For the believer who has been joined to Christ, the marriage has already taken place (Romans 7:2-4; II Corinthians 11:2; Ephesians 5:25-32). However, the Marriage supper is still in the future. According to Jewish custom when a woman was betrothed, the groom went away to prepare for her. He could return at any time, and the bride had to keep herself ready. When he came, it was to the bride’s house where very often they would have a supper. She and her attendants went out to him, and together they entered the doors which were shut, and no one allowed to enter. This is the most likely interpretation of Matthew 25:1-13. For royalty, the marriage supper was held at the bridegroom’s house, and many guests attended. This is seen in Matthew 22:1-14. These customs portray both the coming of Jesus to believers at His return, and also the final celebrations with the completed Bride. In Revelation, we see the figure of the entire Bride, comprising both Israel and the Church, taking her place with God in the new heavens and earth (Revelation 19:7,8, 21:2, 9, 12, 14). It is Jerusalem, the City of God, who is the eternal Bride of God. She will be married to Him and forever dwell under His protecting canopy. The bride chamber was originally a tent or canopy; in Hebrew called a “chuppah.” The wedding ceremony was customarily conducted under the covering of this canopy, and the word chuppah is still used by Jews today of the canopy under which the bride and groom stand during the ceremony. This same canopy is seen in Isaiah 4:5 and is the cloud of His Shekinah Glory, which the Lord will stretch over all the assemblies of Mount Zion; the city of the living God (Hebrews 12:22). As His kingdom grows, so will the “cloud of His glory,” until eventually Heavenly Jerusalem has come, and God and His people will be forever together within its eternal shelter. When Jesus returns, He will be present with His people who will have access to Him, and be able to enter the cloud of His Glorious presence, and His heavenly city. It seems there will be a new relationship between the realm of heaven and that of earth. John saw New Jerusalem coming down out of heaven, like a beautiful Bride. New Jerusalem will be “coming down” to earth, and those who are pure will be entering into its gates. The day will eventually come when the new heavens and earth, the material and spiritual, the visible and invisible, will be united together forever in perfect harmony. Get ready, “The Bridegroom is coming. Dear reader, you will have many questions, but the Lord can reveal to you many things. He is Joshua leading His people to possess the nations. He is David coming as King of Kings to establish His Kingdom. He is the Branch who will build His temple. He is the Lamb of God, High priest, and Judge of all. Like a Bride longs for her Bridegroom, so believers long for Jesus. Those who are looking for Him will one day see Him at His return. In loving Jesus, and living for Him, you too can expect to see Him appear. One day, He will step back to meet with each one who is eagerly looking for him. One day, when you are walking in a garden, or perhaps praying at home, or maybe in a gathering of believers, JESUS will suddenly come to you in His RISEN SHEKINAH GLORY. He is coming in Clouds of Glory as mighty King. With His help, we can share His love with all people. We have a command to witness His name in every nation, and "then the end shall come" (Matthew 24:14). Most of all, there is the expectation of great joy, as we get ready for the most wonderful meeting of our lives - to meet with our GREAT KING OF GLORY. Long ago, Job wrote of his earnest longing to see his Redeemer when, during the end time, He will stand upon the earth (Job 19:25-27 NIV). Jesus will once more walk upon the earth. The Bible ends with a prayer - "Come, Lord Jesus." NOW is the time for each one who longs for the return of Jesus to pray this prayer. In all my life there is only one thing that I long for - that is, to see the KING in His GLORY. Vine's Expository Dictionary - Macdonald Pub. Co.
Simplified Living Bible - Tyndale House Pub.Inc.